It is hard to imagine a time when there could be a flight instruction regimen integrated into a public high school curriculum, but in 1968 an article appeared in American Aircraft Modeler reporting on just such a program at Anderson Valley High School in Boonville, California. It began with the donation (sale of $1 actually) of a Cessna 150 by G&H Aircraft of El Monte. School superintendent J. Robert Mathias, himself an aviation cadet in WWII, welcomed the opportunity with enthusiasm. So did 35 students. In addition to flight lessons leading to a private pilot license, courses were offered in airframe and powerplant mechanics and aviation electronics. Website visitor Janice H. sent me a copy of this 1972 document titled, "A Status Report of Aviation and Aerospace Education in California," by Earl W. Sams, California State Department of Education, Sacramento. With a student pilot at the controls, Anderson Valley High School's Cessna 150 climbs out. It was sold to the school for $1. With 35 of 135 students in air classes, Anderson Valley High may have the most progressive aviation education program in the nation. Next year 80 may take training. 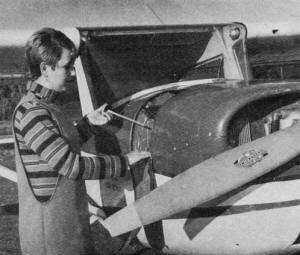 Senior Linda Harding checks oil in preflight check. Determined to become an airline pilot, she worked all summer to raise money to work on her license. Mike Coffman, right, bucks a rivet for instructor Lawrence Johnson. Short of tools, school has only one electric drill for four shop classes. Rivet gun costs $35. Says Johnson, "for that we could get 35 more Cessnas." With a model plane Superintendent J. Robert Mathias beams the pride of his high school aviation program. He was an aviation cadet in WW ll. Flight Instructor John Merriman checks instrument settings with 17-year-old student Mike Ashiku. Merriman teaches junior high school science in addition to his flying duties. Student Don Smith and mechanics instructor, Lawrence Johnson hold student, Linda Harding, while flight instructor, John Merriman tries to cut dress after solo. 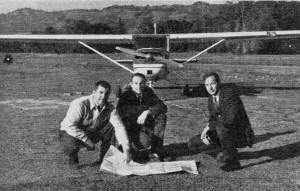 Anderson Valley High School's aviation faculty; left to right: Superintendent, J. Robert Mathias; A&P instructor, Lawrence Johnson; and flight instructor, John Merriman. School will purchase surplus Beech C-45 and S-19 helicopter for mechanic's program. How would you like to attend high school and major in Commercial Flying? Or how about Aircraft Mechanics? 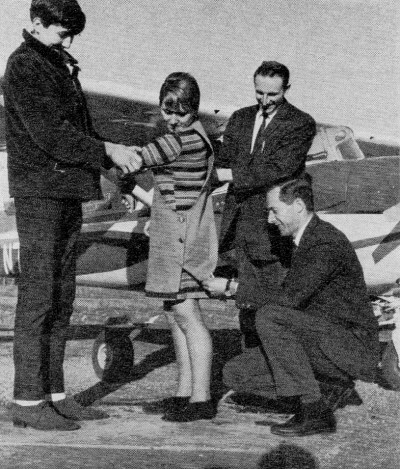 Most air-minded youngsters would give their proverbial right arm to be able to learn an aviation trade in high school. Few have the opportunity. Such is not the case at Anderson Valley High School in tiny Boonville, California Anderson Valley has what is most probably the nation's most progressive aviation education program. As School Board clerk Homer Mannix put it, "The air age is not coming, it is already here." It is with such enthusiasm that the entire community of 950 people greet the program. Progressive education has been given a dirty connotation lately so Superintendent J. Robert Mathias prefers to call it "humanized education." Anderson Valley uses a flexible modular system of scheduling classes. That is a day divided into 20, 20-minute periods. The student spends half his school day in the pursuit of academic classes. The second part of each day may be spent in vocational lab. This system allows the student to spend large blocks of time in the vocational lab of his choice. Mr. Mathias describes himself, modestly, as not aviation oriented as much as aviation frustrated. He was an aviation cadet during World War II, but it was discovered that the Air Corps had a surplus of flyers so he was transferred, along with thousands of others, into the ground forces. Mathias has certainly remained aviation conscious although he never flew after that. As an educator he held a strong desire to add an aviation program to his vocational curriculum, Mathias found a sympathetic ear with Philip E. Nickerman, Director of Vocational Education for Mendicino and Lake Counties. Nickerman himself was a high school drop-out and feels an adequate vocational educational program would have held him in high school, to say nothing of an aviation program. Nickerman and Mathias teamed up and began to plan their program. 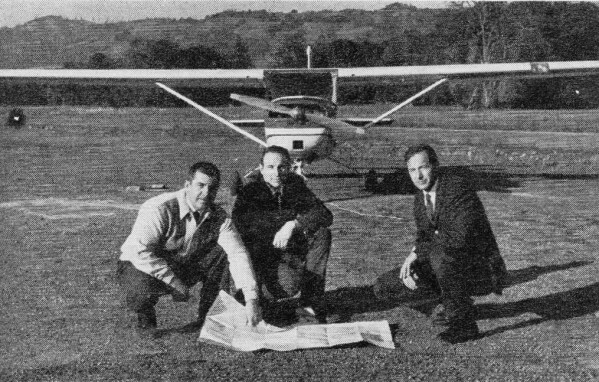 G&H Aircraft of El Monte, Calif. sold the school a 1961 Cessna 150 for $1 and they were on their way. Now they needed personnel. Superintendent Mathias screened several applicants for both post of aircraft and powerplant (A&P) instructor and flight instructor. According to Mathias he received many fine applicants for the positions. 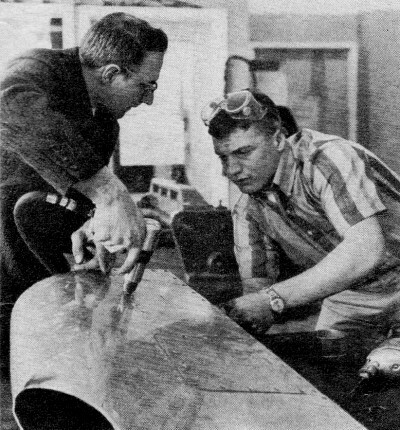 The A&P mechanic position was filled by Lawrence Johnson. Johnson's father was Lawrence W. Johnson, once a top model airplane flyer. Mr. Johnson taught his son to build and fly model airplanes at the age of five. The younger Lawrence Johnson attended Chaffe (Calif.) Junior College and got his A&P license. Upon graduation he went to work for United Airlines. In eight and one-half years with United he became an inspector. 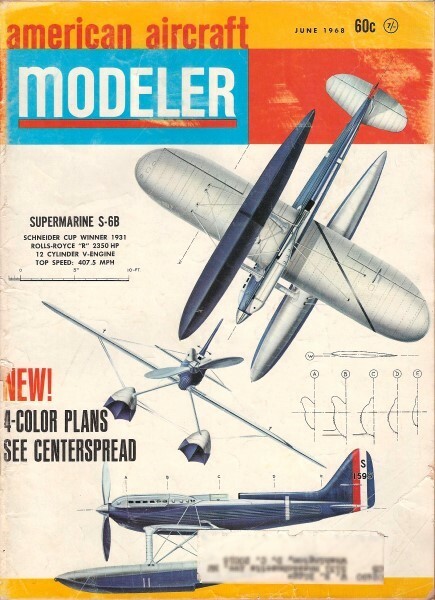 Johnson was always aware of the influence of model aviation both on himself and other mechanics. 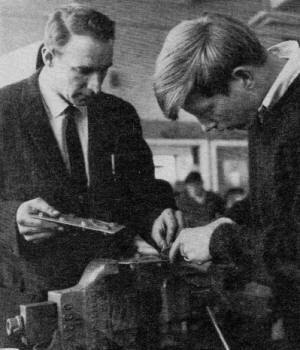 In his experience in the industry he found more than 75% of the mechanics he worked with were or had been modelers. Johnson said, "Anyone who has been a modeler is a far better mechanic. They develop a dexterity and a mechanical reasoning far beyond that offered by a general shop class. In experience I could tell those who had been modelers. This was confirmed later in conversation with the mechanic." Johnson's dedication to his new endeavor is proved by the fact that he left a job with an earning potential of $14,000 plus to accept a position with an earning potential of $8,500. While at United, Johnson worked with young people in his church. He enjoyed the contact with the young people and felt he might enjoy teaching. He went back to college and obtained the necessary degree to teach. When the position opened at Anderson Valley he jumped at the opportunity. 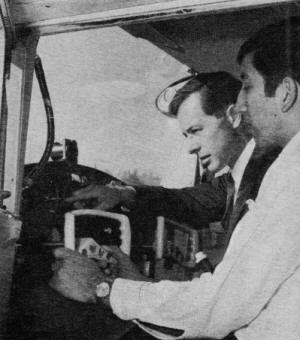 Several capable men answered the call for the position of flight instructor. 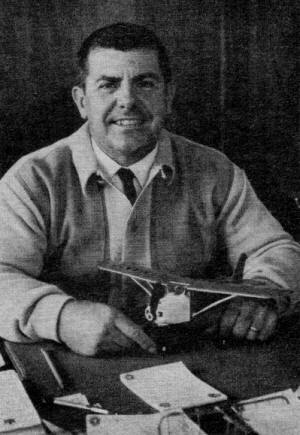 Mathias chose John Merriman, a flight instructor from Manhattan Beach, Calif. Merriman had learned to fly in Buffalo, N. Y. in the family-owned Cub and Stagger-Wing Beech. In 1961 Merriman and his wife moved to Alaska where he obtained his Commercial ticket. He came to California and got his instructor's rating. The opening appealed to Merriman. He had earlier obtained a degree from the University of Wyoming. Work for free-lance instructors is sporadic and he felt the position would give him more full time connection with aviation. Johnson shows student Wayne Hiatt fine points of safety wiring. Students are taught aircraft construction, hydraulic and electrical systems and maintenance. Student graduates with airframe mechanics license after two years of training. Merriman, like Johnson, took a pay cut but enjoys his work more. According to Merriman, the main idea of the program is to introduce students to aviation. No courses were known to be available in high schools as part of the daily schedule. Merriman said, "Second to the agriculture industry in this country, aviation and aerospace hires the most people. Possibly only five or so of the 20 enrolled in the flying program will follow an aviation career. But we do expect to be able to graduate commercial pilots in two years." And no doubt they will. Flight time costs the student but $2.75 per hour. Linda Harding, a 17-year-old senior worked all summer to raise enough money to work on her license this year. She plans to be an airline pilot. "I don't know if there are any female airline pilots in America or not. It doesn't bother me that I may be the first," said Linda. "I have gained other goals I have set for myself and I really don't have any doubt about this one." Linda will graduate this spring with a private license. She plans to work as a nurses aid to raise the money to complete her commercial ticket. There are others who have their eyes on the sky. Sixteen-year-old junior Don Smith is described by both Johnson and Merriman as "a very adept student." He is enrolled in both the flying and A&P program. Don was the first to solo and looks forward to becoming a commercial pilot. Johnson's close personal relationship with United has been helpful. They have furnished material from their educational department. The school receives damaged or obsolete parts to work on. They are loaned models of aircraft systems, some costing as much as $2,000. The school is planning to purchase a government surplus Beech C-45 and a S-19 helicopter for the mechanic program to work on. Johnson is considering the possibility of building an airplane as a class project. 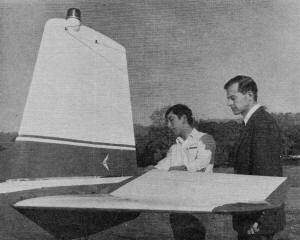 Aircraft could be an easy to fly single seater so the flight program could make good use of it. Those enrolled in the A&P program seem to be less decided about aviation as a career. Most seem to be taking the course for general information. But such contact with the career will undoubtedly realize some later devotees. Flight instructor, John Merriman double checks as Nick Ashiku, 17-year-old student preflights aircraft. School has excellent safety record, having logged well over 200 hours without incident since the acquisition of the plane last fall. The finances to sustain the program come from the school district itself and from the U.S. Government under the Vocational Education Act of 1963. Under VEA 63 the Federal Government splits the cost of vocational education. The cost of operation of the plane is paid by the student. Maintenance is pulled by the students assisted by Johnson. The investment of the district to date has been about $300. The state of California and the nation are watching the Anderson Valley School District and its flying program. From the school's experience they feel that such a s program is possible with nearly all schools. While there is not a wealth of manpower to teach flying and A&P mechanics, there is a beginning. If more of a demand for such educators existed they would undoubtedly become available. There are probably many more people quite willing to aid with the donation or sale of aircraft to schools. The Anderson Valley School District is quite proud of its forward looking school leaders and its fine aviation classes. This year they have 35 of the high school's 135 students actively enrolled. Next year it looks like the figure will jump to around 80. If they can do it so, with the right leadership, so can anybody.